We started the rumor earlier this month that US Cellular was going to be offering a Windows Phone 7 soon. Then the company came out with an official press release. Now the HTC 7 Pro is available for $199 on US Cellular. 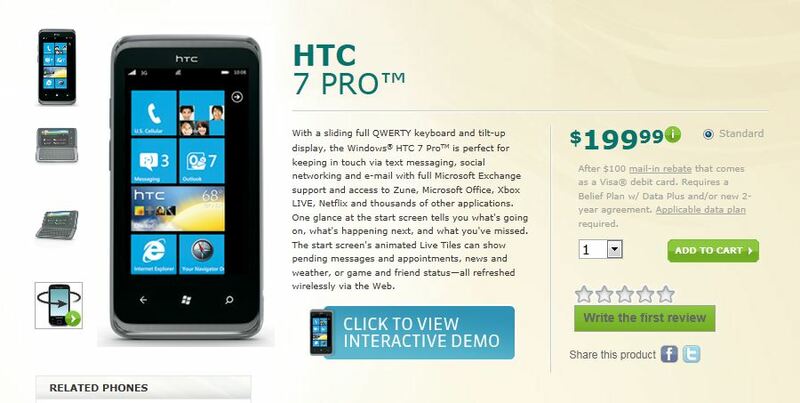 With a sliding full QWERTY keyboard and tilt-up display, the WindowsÂ® HTC 7 ProTM is perfect for keeping in touch via text messaging, social networking and e-mail with full Microsoft Exchange support and access to Zune, Microsoft Office, Xbox LIVE, Netflix and thousands of other applications. One glance at the start screen tells you what’s going on, what’s happening next, and what you’ve missed. The start screen’s animated Live Tiles can show pending messages and appointments, news and weather, or game and friend statusâ€”all refreshed wirelessly via the Web.